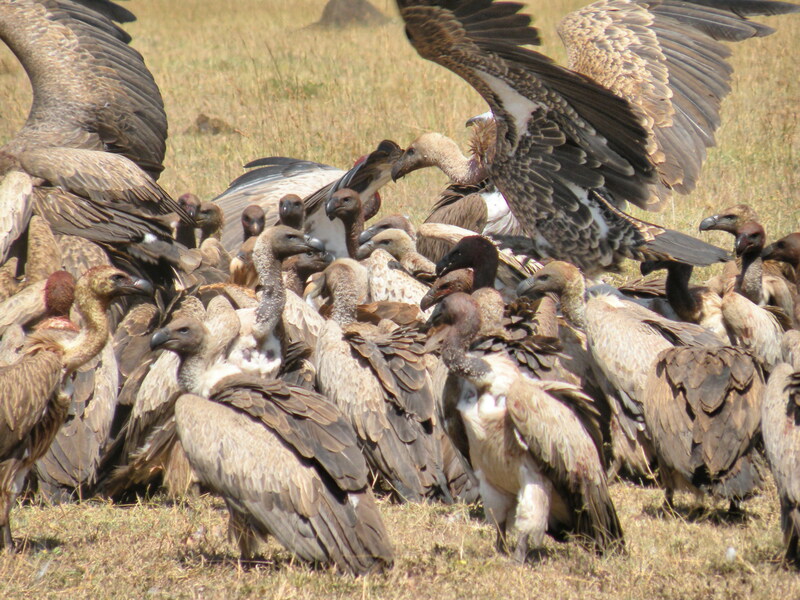 African vultures, nearly all of them, are in big trouble. From the once ubiquitous African White-backed and Hooded Vulture to the decidedly less common Lappet-faced and Cape Vulture, all 11 species of Africa’s vultures appear to be in substantial decline. Unintended poisoning, use in both traditional medicine” and the bush meat trade, and widespread habitat loss all are taking their tolls. Populations of the iconic vultures of Africa appear headed in the same direction their southern Asian counterparts went over the course of the last three decades. And that direction is clearly down, down, down, and down again. With that as background, the Endangered Wildlife Trust of South Africa, together with the Peregrine Fund of Boise, Idaho, organized a five-day Pan African Vulture Summit at the edge of the Masai Mara Nature Reserve in southwestern Kenya. The US Fish and Wildlife Service sponsored the summit, which occurred last week. Forty African vulture biologists and conservationists, together with a handful of European and American biologists, attended the event, the objective of which was to assess the current status and threats to African vultures and attempt to lay out a way forward to better protect them. Those attending the summit heard a series of chilling tales. In area after area across much of Africa once numerous populations of avian scavengers are in significant decline. Declines are occurring in some places more rapidly than others, but overall, the continent is facing an environmental catastrophe, one in which mammalian scavengers will play a larger role in the consumption dead animals, thereby creating a situation in which their larger populations, pose a increased health threat to Africa’s human inhabitants in the form of contagious diseases including rabies. Hawk Mountain was asked to participate in the summit because of the work we are doing with New World vultures and to offer suggestions about how our protocols might serve as a model for continent-wide surveys and studies of African vultures, both to assess the extent of current African declines and to offer ways for understanding the movement and social ecology of the birds, both of which are essential tools for better protecting them. The meeting was one of the most sobering–indeed depressing–I have ever attended. The thought of losing the vulture community of East Africa’s Serengeti Plains and other African savannas that so many of us grew up watching on TV in the 1960s, 70s, 80s, and 90s, strikes at the very heart of global wildlife conservation. That said the summit– and the stock-taking if offered–offer hope that it is not yet too late to save Africa’s vultures and the functional ecosystems that depend upon them. The task will not be easy, but the alternative is unacceptable. Extensive studies documenting the extent of the declines, coupled with intensive studies of the movement ecology of the birds involved, are an essential first step. Both will take money to achieve… a lot of money. My task is to raise the funds as quickly as possible, and we need your help. I will keep you posted as events proceed.